I’ll pick up on that point a little later on. 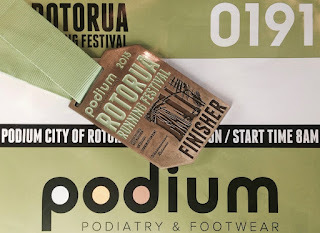 Right now I want to heap as much praise as I can on the organisers of just the 3rd Podium City of Rotorua Half Marathon. Running Events, you guys honestly set the bar so high it’s a wonder you have any competition left! At just $45 to enter you’d expect ready, set, go ... finish, see you next year. Oh no. Let’s begin with the race pack. 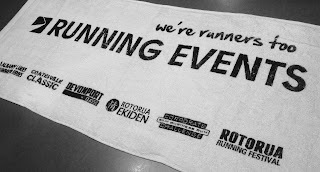 Chocker with premium socks, a high tech running t-shirt, the usual race number and timing chip, promo stuff and the piece de resistance, a promotional white towel. How cool is that! Something useful at last! It’s now race day and I find myself lined up on the shores of picturesque Lake Rotorua. Nothing typical or dull about the start either. A pitch perfect national anthem sung by a local schoolboy, an Oasis song followed closely by a Maori warrior’s conch going off to announce the start. The ‘hero’ shot to this post was taken by Allan Ure. He is one of the country’s best sports photographers I reckon. A really nice guy too. He seemed to pop up out of nowhere throughout the day. Don’t you hate how typical race photo purchasing goes. You know ... buy one for $29 or the entire set for $60. Not Allan. The next day he uploaded 17 images of me plodding along. Near the ‘add to cart’ was a button that read something like PWTW, which translated to ‘Pay what you think they’re worth’. What a cool guy. At around 4k my Dad stuck out his hand to slap mine and screamed something like “they’re puffing like hell in front of you, dropping like flies” which seemed kind of odd given how early it was into the race. Still, that added impetus propelled me forward and I passed a further two runners hoping to make him even prouder. As a runner, if the course was just road, well that would do very nicely. Unfortunately Rotorua is a tourism town and we like to show off. We have forest, Redwoods, sulphur flats and bracken lined fast turning tracks which just have to be explored. I didn’t mind it one little bit either. I love my city and if it meant giving up a minute or so then so be it and with that thought I continued pressing for home. I felt I ran really well on the day. A solid enough start and nice even splits all the way until the final 4k where I battled off road conditions with lots of turns. Oh and I cramped again in both shoulders. If anyone out there can help me on this one I’d appreciate it. I reckon it’s a combination of tension in my shoulders (again look at that lead image of me ... it looks like rigamortis has set into my top half) and a potassium or salt deficit. Finally running through into a clearing I could see home, the finish line and before that both Mum and Dad. Nothing makes me happier than having them there, the best feeling ever. I missed by a mere 5 seconds. 1.29.19 and 16/364 finishers. 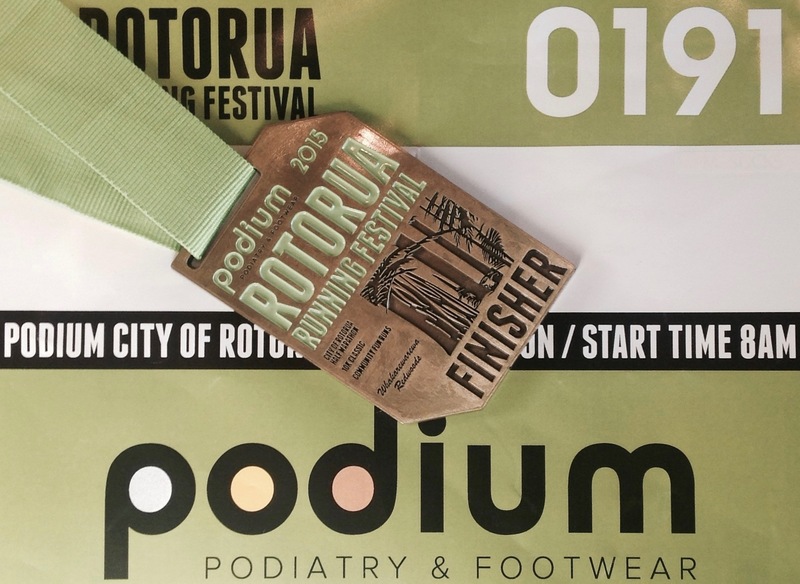 Did I mention Rotorua has the best finisher’s medal? This race report was brought to you by Running Raggedy, a proud local since 1980. Great read again Mark. If you hadn't given Scott Brown a piggy-back during your warm-up jog your shoulders would have been fine. BTW, read an interesting thing about white flags while in DC - armies didn't have them and on one occasion a white tea towel was used to surrender. Not that you'll ever have to use your white towel for that during a race... however, you could lend it to Scott Brown. My spider sense was tingling so I thought Ewen was giving me a hard time somewhere on the inter webs. Well done Mark. really looking forward to meeting you here and going for a run or two and/or a beer or three. Haha Scott -- I'm always offering you "encouragement" on Mark's blog. Watch out!